Dust mites count on humidity in the basement to live, dehumidification can get rid of dust mites. Problems with dust mites and other indoor allergens and pollutants are becoming more prominent with each passing year. In fact, ICS Cleaning Specialist Magazine reports that the prevalence of asthma and asthma-related health problems has increased by an astounding 75% from 1980 to 2001 alone! There are a thousand dust mites in a gram of dust. 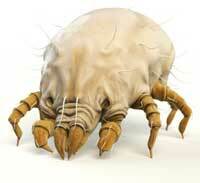 A single dust mite defecates 20 times a day, creating 200 times its body weight within two months. 54,000,000 Americans suffer from allergies. Dust mites spread rapidly, so it's important to seek professional help from your local Basement Systems dealer to prevent the problem from becoming severe. 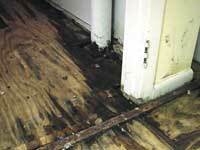 Call today or click below to get started with a free estimate! According to the American College of Allergy, Asthma and Immunology, 50% of all respiratory illnesses are caused or aggravated by polluted indoor air. The Environmental Protection Agency (EPA) statistics show that the levels of many airborne pollutants are 2-5 times higher than the same levels outdoors. The bottom line? The EPA ranks indoor air pollution as one of the top five environmental risks to public health, and dust mite allergies are among the leading causes of these problems. Dust mites grow and spread at an alarming rate in every household - no matter how clean it is. Dust mites can grow from eggs to adults in a single month, and they begin to reproduce after only ten days, with females laying up to 2-3 eggs each day. They live 30-100 days, with females laying as many as 270 eggs before they die. According to National Wildlife Magazine, the waste they create continuously as they live counts for 80-90% of the allergic component of house dust. Dust mites spread a wide variety of allergens into the home that will cause many health issues. American Family Physician states that controlling dust mites is the most important thing you can do in your house to make your asthma and allergies better. Since this is the most common chronic disease among children, the problem is too important to pass by. Allergies generally develop from ages 6-26, with symptoms emerging late if the environment changes from one with few allergens to one with more. Dust mite feces contains more than 15 potent allergens that sensitize and trigger allergic reactions in predisposed people. Approximately 10% of the general population and 90% of asthmatic patients are sensitive to dust mite feces allergies, and in many cases, asthma and dust mite allergies symptoms could be decreased or eliminated entirely by reducing exposure. The American Academy of Family Physicians recommends removing carpet that's been laid over concrete and reducing indoor humidity in the home and especially in the basement. All sources agree that if humidity is lowered below 60%, dust mites will no longer be able to absorb moisture from the air and will dehydrate. As they become unable able to thrive, and they will begin to grow dormant and die. 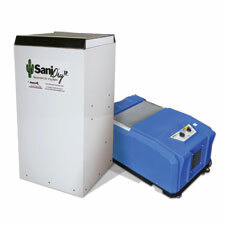 The SaniDry™ can remove particles as small as two microns from the basement air. At this size, it's effective enough to remove dust mite feces and most mold spores from the basement environment. This Energy Star rated basement dehumidifier removes 100 pints of water from the basement with the same energy as some 40-pint models on the market. As the relative humidity lowers below 60%, most mold, mildew and dust mites will be eliminated. Unlike some basement dehumidifiers, the SaniDry™ basement dehumidifier is able to drain itself automatically, saving the you from the continuous chore of emptying basement dehumidifier collection trays. Since dry air is much easier to heat and cool than damp, humid air, removing this moisture will make the entire home more energy-efficient. The SaniDry™ can be ducted into other rooms, allowing a finished basement's air to be clean and dry while the SaniDry™ is securely tucked away and out of sight. An optional additional air filter available with the SaniDry™ can remove odors and musty smells from the basement air. Save money on your home while helping to remove mold and kill dust mites to make your whole home healthier and more comfortable. Call a Basement Systems dealer for a free basement dehumidification estimate today!